I like birds. I also like 80’s music. So I thought it would be fun to combine the two and write another song parody. My work as a naturalist at the World Bird Sanctuary involves interacting with a wide variety of birds. One of my favorite birds to care for is Wookie, our African Grey Crowned Crane. Crowned Cranes are large birds with long legs and have a set of golden feathers on their head that resembles a koosh ball. These cranes often put on mesmerizing displays during the breeding season. A crane might honk, dance, leap, and spread its wings during courtship rituals. Wookie is a special bird because she has performed in zoo shows before; flying across a stage to land on a stump. She got her name because her grunting sounds similar to the wookies from Star Wars. One of my favorite 80’s songs is “Africa”, by Toto. I now present to you my version of “Africa”, featuring crowned cranes. Because I haven’t blogged in a few months, I thought a good way to get back into action would be to write a bird-themed Christmas poem. This poem is about some of the birds who live at the World Bird Sanctuary, where I work as a naturalist. My position involves caring for birds of prey, which includes a lot of food prep and cleaning! I also get to play a part in some really cool work, such as training raptors for flight shows and working with a young raven named Mayhem. I did a couple of “Owl Prowl” shows recently and also had the opportunity to take a Bald Eagle to an Eagle Scout ceremony! If you are in the St. Louis area, come check out the sanctuary (Admission is free!). I hope you enjoy the pictures and the poem! Have a wonderful Christmas! All the raptors were stirring as snowflakes took flight. Spending quality time with Reese the Great Horned Owl. The food bowls were placed in enclosures with care. The storks were quite quick to make their bowls bare. The parrots were talking, their voices quite loud. Performing for peanuts in front of a crowd. The barn owls were nestled, all snug in their beds. While visions of rodents danced in their heads. The falcons were chasing their food on a lure. Their flights looked like dances, with wing-beats so sure. Zorro the Aplomado Falcon. Photo: World Bird Sanctuary. The vultures were jumping, their food could not flee. The hawks started screaming, one jumped on a tree! The owls started hooting as the sky became dark. The eagles were cackling, oh how Max did bark! Working with Max the Tawny Eagle. Nemo the African Grey Parrot. Vultures are often misunderstood. Commonly called “buzzards” (which are actually hawk species in Europe and Africa), and sometimes dismissed as trash birds, vultures are actually cool birds that help the environment. When an animal dies, vultures often feed on the carcass. Their stomachs are equipped to break down bacteria and other dangerous elements that would harm humans or other wildlife. The spread of diseases such as anthrax are limited due to the effectiveness of vultures cleaning up decaying animals. This is a song about the life of a vulture. Some cool vultures! Clockwise from top left – King Vulture, Egyptian Vulture, Indian Vulture, and Lappet-faced Vulture. Butterflies are fascinating insects. They begin life as caterpillars, which creep along the ground and on trees with tiny legs. They then form protective structures called chrysalises and morph into fragile, but beautiful flying creatures that feast on nectar from flowers. You may know about all this, but did you know that some butterflies get drunk while sipping on rotten fruit? Or that there is a species that feeds only on peanut plants and tastes delicious with jelly? Time to learn about some butterflies! Perhaps one of the most famous species of butterflies is the Monarch Butterfly. Monarchs are known for their incredible migrations, which sometimes involve flying thousands of miles!! Most butterfly species can overwinter and survive winter conditions as larvae. Monarchs, however, are more sensitive to the cold and many will travel to winter in Mexico and southern California. So how do these small creatures migrate such great distances without getting lost? The answer seems to be connected to the sun. Monarchs are able to follow the position of the sun and keep track of the time of day through neurons located in their antennae and eyes. If you’re interested in learning more about this fascinating phenomenon, check out this short article. Monarchs are also known for being poisonous. They lay their eggs around milkweed plants. When the caterpillars hatch, they feed on the milkweed and store toxins from the plant in their bodies which are retained in the adult stage. Viceroy Butterflies are similar in appearance to Monarchs and were once thought to be using Batesian Mimicry, which is where a non-poisonous species mimics a poisonous species to use to its advantage. Studies conducted by researchers in the 1990’s revealed that Viceroys actually taste unpleasant to predators as well, thus these butterflies and Monarchs may be using Mullerian Mimicry, where each species benefits from their visual resemblance. If a Blue Jay tries to eat a Monarch or Viceroy and experiences a foul taste from the toxins, it will probably be less likely to attack butterflies with that color/pattern in the future. Left – Monarch Butterflies. Right – stages of chrysalis formation. Swallowtails are cool members of the butterfly world which even a novice like me can identify. Named for their forked tails, swallowtails comprise hundreds of species throughout the world and tend to be quite colorful. Among the common species in the eastern/midwestern portions of the United States are the Spicebush and Tiger Swallowtails. Spicebush Swallowtails are named because females will often lay eggs on the leaves of spicebushes, which provide valuable food for larvae. I’ve enjoyed watching the interesting flight patterns of these colorful species and often find them in the woods while doing trail work. Most caterpillars feed on the leaves of trees or shrubs, while adults drink nectar from flowers and also feed on fruit. Occasionally, butterflies will drink from fruit that are rotting and fermenting, resulting in some tipsy butterflies! They will also apparently drink from beer cans and wine bottles, according to this report by National Geographic. 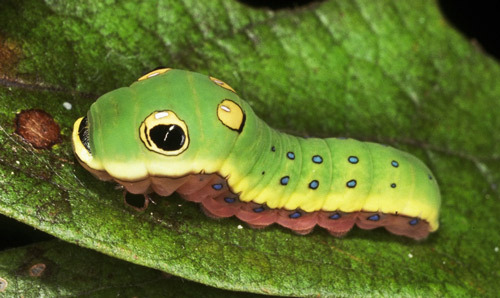 Spicebush Swallowtail larvae have eyespots to confuse predators. Photo by Jerry F. Butler, Entomology and Nematology Department, University of Florida. The top two pictures are of Spicebush Swallowtails. On the bottom is a Tiger Swallowtail, while the 2nd picture from the top right is of a female with an alternate look. I plan to make an effort to learn more about butterflies and how to identify them. There are many amazingly colorful species all over the world which I know hardly anything about. Perhaps I’ll be able to attract a variety of species by planting new wildflowers. Hopefully you have some flowers or a garden that attracts these interesting creatures. Now if you’ll excuse me, I’m going to down a milkweed brew and mimic a tiger while flying erratically. Do you enjoy spending time in nature and seeing cool animals? Many people are familiar with some of the wildlife that may be encountered during a hike in the woods. You might expect to see deer or turkeys or raccoons or squirrels. However, there are smaller members of the animal world that are quite fascinating and can be missed if you’re not looking carefully. There are insects that look like sticks, lizards that can lose their tails, and harmless butterflies that mimic poisonous species! I’m surprised there isn’t a Spiderman villain that was created from a radioactive butterfly bite. Believe it or not, the first female black superhero in the comics was called “The Butterfly”! Anyway, it’s time to learn about some trail treasures! My current job at the World Bird Sanctuary involves managing the restoration of their trails. I’m engaging in the removal of invasive species and helping create an environment which fosters growth of native plants and attracts wildlife. The goal is to provide an enjoyable experience for the public and encourage them to walk the trails and interact with nature. One of my first steps in this process was to remove invasive bush honeysuckle, which releases chemicals into the soil that inhibits the growth of native plants and restricts biological diversity. While pulling out honeysuckle bushes, I often come across interesting little creatures in the forest understory. There are plenty of ants and spiders crawling across the leaf litter. Sometimes I find a turtle buried in the dirt or a frog hopping by a tree. I also occasionally find walking sticks, insects that actually look like sticks! Some species even have body parts which resembles leaves or twigs. These creatures are part of the Phasmatodea order of insects, and have a wonderful built-in camouflage system that enables them to escape detection from predators, unless you’re a predator that enjoys munching on sticks. Perhaps beavers occasionally eat walking sticks on accident?! Walking sticks are often colored brown or green to blend in with their surroundings and are quite widespread across the world. Members of the largest species can grow up to a foot and stretch out to almost two feet when you include the legs! Walking sticks that I’ve encountered while doing trail restoration. The one on the left actually climbed into my shirt pocket! The skink family is quite diverse, with over 1500 species spread across the world! Skinks are lizards that can often be found in forests, mountains, deserts, shopping centers, or even running around houses! One common species in the U.S. is the Five-lined Skink (Plestiodon fasciatus), named for the distinct pattern of lines across its back. Juveniles of this species (and some other species) have beautiful blue tails. Five-lined Skinks grow to about 5-8 inches long, and are generally found in forests or forest edges with plenty of natural cover, such as rocks, fallen logs, bark, and leaf litter. These skinks prey on a wide variety of insects, and will occasionally consume small vertebrates such as frogs and other lizards. Like many other lizard species, Five-lined Skinks can voluntarily break off segments of their tail in order to confuse or distract a predator! The tail will eventually regenerate and the skink may survive another day. A tiny taste of skink diversity. Top left – male Five-lined Skink. Top right corner – Juvenile. Below that is a picture by J.J. Harrison of a Blue-tongued Skink in Australia. Bottom = Skilton’s Skinks. Butterflies are interesting and colorful creatures. These animals start life as caterpillars and morphs into wonderful flying insects. My next blog will look at the often overlooked wonders of the world of butterflies. Be prepared to learn about poisonous species, species that use mimicry, and butterflies that get drunk! Hopefully this post has piqued your interest into looking for forest creatures like walking sticks and skinks when you hike in the woods. Sometimes these creatures can also be found in your backyard! If you see a small lizard running for cover across some rocks or around your house, you may be observing a skink. Now if you’ll excuse me, I have a sudden craving for pretzel sticks. Lord Howe Island pretzel stick insect, sometimes called a “land lobster”. In my last blog post, I wrote about owls that live underground and Snowy Owl chicks that grow faster than the national debt. Now I’m ready to reveal the world of ghost owls and talk about how young owls can climb trees. As usual, there will be no puns or ridiculous stories in this post. Barn Owls are sometimes known by the nickname “Ghost Owls” due to their white coloration, their nocturnal nature, and their raspy screeching. Barn Owls get their name from their tendency to hang out with nobles at large chain bookstores in barns. They are found almost worldwide, though they are in decline in some regions. Barn Owls stand around a foot high and generally weigh a little over a pound. These owls have excellent hearing, as their heart-shaped facial disk helps funnel sound toward their asymmetrical ears, creating a parabola effect which amplifies sound waves. Lab experiments have revealed that Barn Owls are capable of finding prey in total darkness! They are also great at controlling pests like mice and rats, as they often prey upon small mammals. Like other owls, they swallow prey whole and cast up pellets of indigestible parts, such as bones. Their call is a raspy screech and they sometimes produce low chittering noises. To be honest, we should probably name them screech owls, as the calls of actual screech owls sound quite pleasant. In my experiences working with Barn Owls up close, I’ve seen that they are wonderful fliers with beautiful buffy brown and white wings. The babies on the other hand, are balls of fluff with gray faces. I’m currently helping to raise a baby barn owl and two young barn owls that were born at the World Bird Sanctuary. The two youngsters are actually different races – Orion is American and Whisper is European. Orion is noisy and boisterous, often climbing around his enclosure, while Whisper is quieter and well-behaved. The baby is growing up fast and her feathers will soon start filling in. Orion and Whisper looking out the window. So can young owls really climb trees? Yes they can! Owls that are not yet ready to fly need a mechanism to escape danger from the ground. Some young owls are able to spread out their wings and use their beak and talons to climb up trees! Check out this news article that includes pictures of a young Great Horned Owl that climbed up a tree after falling from its nest. You can also search for climbing owl on Youtube and see some short videos of owls in action! Below is a Barn Owl that decided to shimmy up a tree. Now that you’ve learned about Barn Owls, maybe you can visit a nearby barn at night and find an owl! Though I’ve handled these owls, I’ve never actually seen one in the wild. Perhaps I will find one soon! Now if you’ll excuse me, I’m going to dress in white tonight and make raspy noises while climbing up a tree. Did you know that a group of owls is called a parliament? Did you know that most owls use the nests of other creatures? Did you know that some owls live in underground tunnels? Did you know that young owls can climb trees? Did you know that there are “Ghost Owls”? Did you know that one of the most vicious gangster owls was Owl Capone? Time to learn about some cool owls! Owls are generally solitary birds, except during the breeding season. If you do happen to find a group of owls hanging out together, you’ve managed to find a parliament! Though they are more efficient at accomplishing tasks than many human parliaments, most owls don’t build their own nests, but use abandoned Red-tailed Hawk nests or tree cavities created by woodpeckers. Female Short-eared Owls will often form a nest in the ground and arrange feathers and grass around the mound, whereas Snowy Owls will hollow out depressions on the tundra floor. These owls choose their nesting sites so that the surrounding vegetation or hills will help conceal their nests. An exception to these examples is the Burrowing Owl. These owls utilize burrows created by badgers, ground squirrels, prairie dogs, or other creatures which dig underground tunnels. Sometimes Burrowing Owls will excavate their own burrows or even nest in PVC pipes! I guess you should be careful when constructing potato guns. Interestingly enough, some owls will place mammal dung at the entrances of burrows! Some scientists believe this is used to attract dung beetles, which will serve as food for the young. Other researchers suggest that the odor may deter potential predators. You probably shouldn’t try this at home! Female Short-eared Owl with chicks at nest. These owls get their name from the short tufts (which are not ears) that project above the head. This Burrowing Owl appears to be auditioning for Angry Birds! Parent feeding young Burrowing Owls. Once the eggs have been laid, incubated, and hatched, the parents spend a lot of time hunting. Young owls grow very rapidly and needs lots of food to keep up with their high metabolism. The chicks of ground-nesting owls may eat close to their weight and increase in size by over 50% in a single day! This rapid development is important as owl chicks on the ground may be vulnerable to predators such as foxes and wolves. After they are about 2-3 weeks old, young Short-eared and Snowy Owl chicks begin moving away from the nest, though the parents still feed and care for them. Chicks are often fed rodents, and some owl species experience population explosions when there is an abundance of valuable food sources. For example, Snowy Owls sometimes experience population booms through large clutches of eggs when there are high numbers of lemmings in the summer. These irruptions may drive northern-dwelling owls further south than normal. I sometimes venture farther away from home if there is a good supply of delicious ice cream. Clockwise from top left: 1. Snowy Owl chicks at nest, 2. Female with two owlets, 3. Female in flight, 4. Male feeding young. Females generally have more dark markings than males. Well, I’m getting tired and tomorrow I have to help care for the raptors at the World Bird Sanctuary. Hopefully you’ve learned some interesting things about these amazing birds! My next blog will be about owls climbing trees and acting like ghosts in the night. I suppose that’s owl for now, but don’t worry, owl be back! This Great Horned Owl is not impressed by my bad puns.